Today the Church traditionally remembers Jesus being anointed with oil by Mary Magdelene with priceless oil which was highly criticised by Judas saying the item could have been sold and raised money for the poor, causing a spate between Judas and Jesus, where Jesus hints that he knows his time is short. 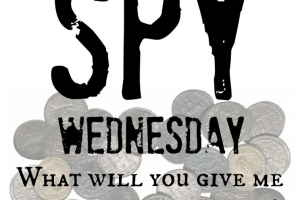 So today is called Spy Wednesday, because of Judas’ decision to betray Jesus to the authorities, and was looking for an opportunity to do so at a time when there were less people to defend him. Judas’ betrayal has always been a huge paradox to me – how could someone who knew Jesus so well go against a man he thought was the Messiah. The writers of some of the Gospels try to say that somehow Judas was overcome with evil, which is why his behaviour changed so much. Although I believe in evil, I do, like Walter Wink says, evil is manifested by human selfishness and violence. This being so, I think I understand Judas’ as being utterly disappointed with Jesus. His anger and betrayal are because Judas wants Jesus to be a different type of Messiah – more the muscular Christianity and physical type, to throw out the Romans and set up a Theocracy to dominate the world. So Jesus is a disappointment event to his disciples, and this speaks powerfully to us now in the 21st Century. So often Jesus’ call to live according to love and the common good just does not make sense in such a competitive and violent world, where humanity is not valued and often commodified. So Jesus’ challenge is often seen as a weak force, too weak for many who want a warrior-Messiah. In so doing, they miss the subtlety of Jesus who is his own brand of Messiah. And it seems that Mary Magdelene is the only one to recognise this, again those who are marginalised and denigrated understand who Jesus really is. Judas represents all forms of Christianity and the Church who assume Jesus is absent and has no power and so do the most terrible things in the name of Jesus and God. Christian fundamentalists being an obvious example. Mary Magdelene – is offered here as a good disciple and as we know later, was probably one of the founding disciples of the early Church before patriarchy denigrated alongside other key women disciples in the Early Church as the Church becomes infected with the DNA of the Roman Empire. So today we remember humbly that Jesus comes as a Servant Messiah – not a Testosterone God and I for one are so grateful that Jesus is this type of Messiah, that brings real hope of change for the world through love.